Durga Puja marks the homecoming of goddess Durga and undoubtedly the biggest festival closest to a Bengali’s heart. It has also become one of the biggest marketing opportunities for brands across various categories to reach out to their respective TG. With footfalls of around 1-2L per day at some of the most reputed pandals in west Bengal, the kind of visibility that the brands can get is immense. This festival has evolved many folds in the last one decade. The art and décor of the idol and pandal is stupendous. The amount of time and money that is spent on extensive research, planning and execution is commendable. This event provides immense opportunities for brands to talk directly to their TG. These days brands have taken it to the next level. Earlier, brands intervention was limited to banners and festoons in the vicinity of the pandals. But now, they have seamlessly mingled with the overall theme of the celebrations across TV, Newspaper & Digital. Marketers should also ensure that the communication is not thrown directly into the face of the audience. If planned properly Brands and the Puja both can enter into a symbiotic relationship, where both can benefit. Vodafone’s associating with this event in Kolkata was one of the best example of integeration between brands and Puja. The campaigns during this period would welcome Durga Puja with the marquee property Vodafone Agomoni(Musical event) followed by OOH branding across various pandals, special tariff plans, TVCs etc. Although a British brand but over the years Vodafone seamlessly integrated itself with this festival in west Bengal. Not alone in Kolkata back in Mumbai & Delhi, there are some celebrity Durga Pujas like Abhijeet Bhattacharya’s Lokhandwala Durgotsav and Mukherjee badi pujo (hosted by Kajol and Rani Mukherjee’s family) which attracts a huge footfall every day. Many come here, not only for the Durga Puja but to get a glimpse of Bollywood stars like Kajol, Rani, Ranbir Kapoor, Sushmita Sen, Munmun Sen, Bappi Lahiri and the likes. Others try their luck at getting food served by any of these Bolywood and TV celebrities. I have seen a lot of Durga Pujas getting a facelift due to sponsorships. The event venue is maintained better, transparency sets in every aspect of the committee organizing it, there is more accountability and of course there is more budgets to think of the craziest creative ideas and also donate towards welfare activities. Pantaloons:From spending quality time with family to catching up with old friends to loads and loads of shopping, this beautifully voiced video by Konkana Sen Sharma would make you want to leave everything and revel in the festivities. Shoppers Stop: Highlighting the ease of online shopping, Shopper Stop released their ad around Durga Pujo capturing the essence that the festival is all about sharing and spreading smiles. Lifestyle: ScoopWhoop in association with Lifestyle has released a hilarious video titled ‘Things Bengalis do during Durga Pujo’, where they have captured the excitement of Pujo. Right from ‘Kota jama holo’ to ‘Asche Bochor Abar Hobe’, it has everything. Tanishq:Tanishq narrates a beautiful story about a woman who is organising Durga Pujo for the very first time. She is anxious whether everything will turn out to be fine. Her father gifts her a pair of bangles and comforts her by saying that she has done a fabulous job. Century Ply: CenturyPly is celebrating the unsung clay artisans of Kumortuli without whom Durga Puja would be impossible to celebrate. The campaign invites people to share pictures of the idols being made or of the finished idols during the Pujas, along with the name of the artisans making them. Three of the artisans getting most number of entries will be awarded and the top five photographers will win prizes. TOI: Times of India has made use of the festival in an innovative way to break the stereotype social practices in Sindoor Khela with its #NoConditionsApply. Keeping up with the change in taste of viewers, Kolkata TV network is coming with a very interesting twist this Puja with Superstar DEV touring across West Bengal, interacting with people and covering Durga Puja. The activity started with Kite festival on 17 sep (Vishkarma Puja ) followed by Pandal & Housing complex activations . Interesting line up of shows like LIVE ADDA & MUSIC, Jelar Shera Pujo (Pujo @ Districts) PUJOR Selfie contest etc. 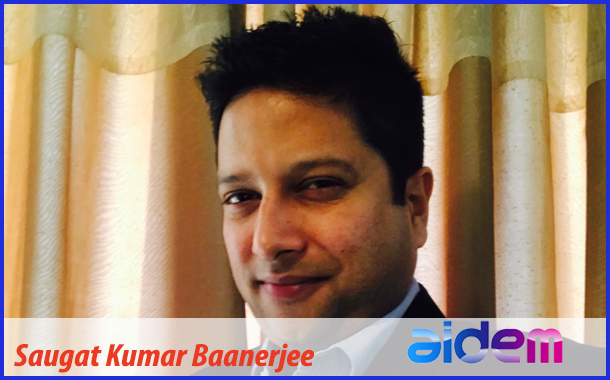 Saugat Kumar Baanerjee is the Business Head – West Bengal Cluster -Aidem Ventures a seasoned sales & marketing professional with over 12 years of experience in the Media & Telecom Industry with key skills of Business development, Marketing, Client Servicing & Partner management.